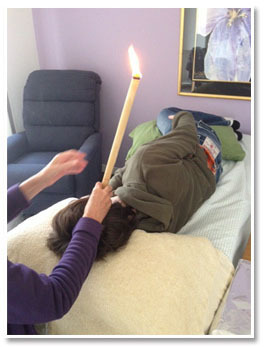 Ear Candling may assist earwax and toxins to be removed from the ear. An ear candle is a long hollow tube made out of calico, beeswax and hypericum. One end of the candle is lit with a match and when the smoke draws at the other end, the smoking end is placed inside a small cone and inserted into the opening of the ear canal. The treatment is very gentle and soothing. The treatment may assist with recurrent ear infections, tinnitus, swimmer’s ear, sinusitis, hay fever, some types of headaches, or those who regularly have blocked ears. Prior to the candling you will receive a 15-minute massage whilst lying on the table, then you will be placed on your side for the first candle to be put in your ear.